Microsoft has explained what happened to the Start menu in the latest version of Windows 8. The Windows 8 consumer preview has just launched and one familiar feature to Windows users is nowhere to be seen. 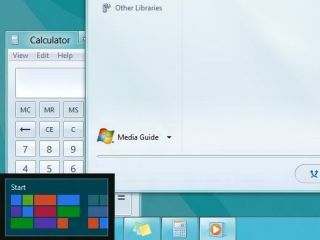 However, Director of Windows Program Management Gabriel Aul told TechRadar that the humble Start Menu was not AWOL. "We didn't take the Start menu away," he points out; "it's just zero pixels. "In the lower left corner you have Start where you expect it to be, you click it to jump back to Start. "Or if I go to the lower corner and push up, I get that same switching list." Windows 8 is a bold new vision from Microsoft, embracing touch with its new Metro interface and hoping to prove that the operating system can move seamlessly into the next generation. The Windows 8 Consumer Preview is available for download from Microsoft now. To get it, head over to http://preview.windows.com.